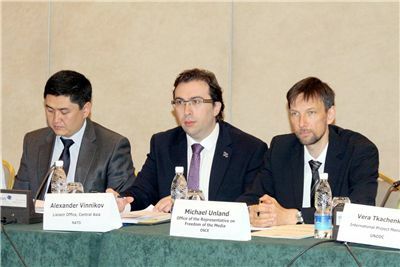 A second workshop was organized on 9-11 July 2014 in Bishkek, Kyrgyzstan, focusing on cooperation between the government and the Media in countering terrorism in the region. A total of 48 people participated in the workshop, including government officials (representatives of state media, national security, ministries of foreign affairs), independent media professionals, two Afghan media professionals, representatives of international and regional organizations as well as representatives of observer countries (Russia, US). •To raise awareness among representatives of the media and government communications offices about the importance of cooperation between government and media/civil society organizations in countering the appeal of terrorism and practical and ethical means for such cooperation. Participants discussed the challenge of cooperation between the media and the government in ways that ensure that counter terrorism efforts do not erode the freedom of the press. The task at hand is to strike the right balance between ensuring the principles of freedom of media and guarantees for free public access to information on the one hand, and, on the other hand, curbing the use of media for terrorist propaganda. After discussing the specific motivations and means that terrorists make use of the media for their narratives, recruitment and propaganda purposes, participants concluded that sustained cooperation would be necessary between the governments (including security officials) of the region and representatives of the media in order to counter this usage. This relationship, however, should be voluntary and not compromise the principles of a free and objective media, since this would undermine its credibility and could be counterproductive. They came up with a set of recommendations for concrete follow up activities and strategies to this effect.